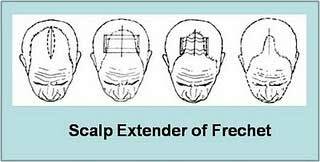 They are no more used for hair restoration surgery but are still being used for some scalp defect following burns or trauma for coverage of exposed bone. 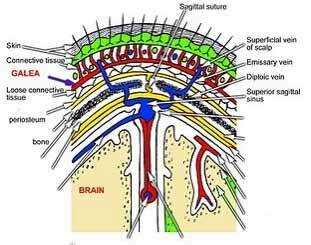 SCALP has 5 layers (S: Skin C: Cutaneous Tissue A: Apponurosis (Galea) L: Loose Areolar Tissue P: Pericranium) Some people believe that 3rd Layer Galea or Apponurosis (which is a tough sheet like layer under the skin) constricts over the blood vessels passing through it to the skin and does not allow enough blood to pass through it to the skin. This leads to hair loss. Well this theory is never been proven. 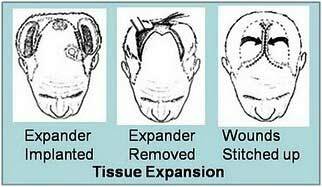 Galeatomy or cutting of Galea to relieve the blood vessel constriction is devised with the hope that it will carry more blood to the skin and will therefore control the hair loss. This theory was never been proven and those who have performed this surgery in the past have never substantiated this belief. It is also important to note that most of the scalp blood supply comes from front and back of the head and not from the underneath the Galea. These vessels are above the Galea and they do not have to cross the Galea. Hair plugs name originated in the 1950’s when hair transplantation procedures were first being used. 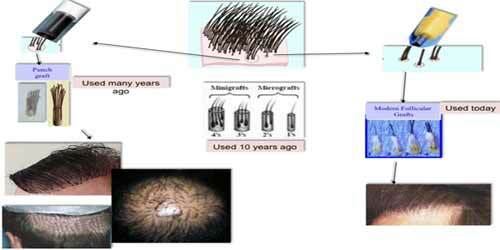 At that time the state of the art in microsurgery did not exist so surgeons were forced to work with large circular or cylindrical block of bunch of hair of scalp skin from the backside of the head. This gave results that looked like the artificial hair that is plugged into a cheap dolls head. The results were not really as good as they could have been. . This gave a result that was not very pleasing as the hair tufts tended to just stick up in unnatural direction. This is actually where the term hair plug came from. The transplanted hair looked like the plugs of hair that are stuck in a cheap dolls head. Most of the time the procedure was very noticeable like the bristles of the toothbrush or appearance of cornrow. This has now changed as the new techniques allow for implantation of individual follicles (called Follicular Unit Transplant). This allows the surgeon to place the hairs at different angels allowing him to match the growth direction of the existing hair.